There are companies in Eden Prairie Minnesota that offer window replacement services. Only a few, however, offer a full frame replacement. Those who do not offer full frame replacement are likely to not even mention it, but for such a big decision, homeowners should have all the information. So what is a full frame replacement? What is the alternative? Which is right for you? What is a Full Frame Replacement? 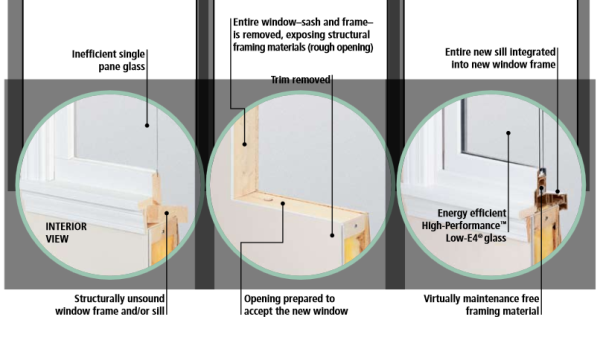 When replacing windows in existing construction, a full frame replacement more closely mimics the installation process used in new construction. The entire window frame and sash are removed and the entire rough opening is visible. Modern, improved flashing, and sealants are used to install the new window, often resulting in superior weather tightness without the loss of any glass viewing area. A full frame replacement process may be the better option for you if there is rot in the existing window frame, trim, casing, or sill. A full frame replacement can improve situations where the window is out of square, or installed improperly the first time. A full frame replacement is also ideal if you would like to change the size or shape of your existing window. Insert windows are installed directly into the existing frame of the window being replaced, allowing you to get the latest window performance features while minimizing disruption to your home. Insert windows preserve the original frame, exterior trim, exterior siding and interior casing. Insert window replacement may be an option for you if there is no rot in the window frame, your window frame is not out of square, and you want to replace a worn window with a new window of the same size in the existing frame without disrupting trim. In an insert window installation, the window stops, lower sash, and upper sash are removed, but the window sill and frame are left intact. The right decision can only be made after a thorough assessment by a trained professional. This will determine if there are factors that necessitate the use of a full frame installation or if an insert can be used. If conditions are such that an insert may be an option, then the preferences of the homeowner will also be considered. For example, even if an insert window can be used without compromising the integrity of the installation, a homeowner might consider the fact that an insert window will reduce the amount of visible glass as a new window is inserted in the frame of the old window. This may or may not be enough reason for the homeowner to instead opt for a full frame replacement. At Klingelhut Window, our initial consultation includes an in-home assessment of your current situations. We will look for signs of rot or windows that are out of square and instruct homeowners when a full frame replacement is warranted. By careful inspection and professional measurement, we can also recognize situations where an insert window is an option and advise homeowners in their final decision. If you have been considering replacing the windows in your home, don’t jump into it without all the information. We offer several series of quality Andersen windows, both Full Frame and Insert models, and can recommend the product and installation process that is just right for your specific situation. Contact Klingelhut Window to discuss your project or to schedule your consultation.